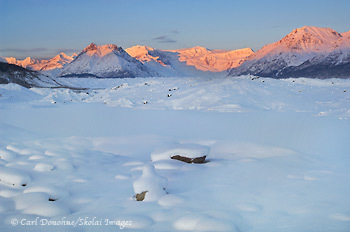 Donoho Peak, Stairway Icefall, Ahtna Peaks, Wrangell Mountains, winter photo. Wrangell mountains and winter’s release. Winter snow covers Kennicott Glacier and alpenglow catches the peaks of the Wrangell Mountains and Stairway Icefall, Wrangell St. Elias National Park and Preserve, Alaska. Please click on the photo to view a larger version of the image. The Wrangell Mountains in winter. Alpenglow catches the eastern edge of the range. This view is looking up the Kennicott Glacier. At right is the edge of Bonanza Ridge, Jumbo, Then Stairway Icefall, Donohue Peak just left of center, and the Ahtna Peaks behind that to the left. Winter’s finally wrapping itself up here in the north; it lingers much as the sun’s final rays cling to these high peaks at days end. Spring makes it’s way north slowly, and and is completely diurnal for now. The days, growing longer weekly, yield. But the night belongs to the winter, the cold, dark silence of the quiet time. This is the first real “view” I ever had in Wrangell – St. Elias National Park and Preserve, all those years ago when I first ventured north on a backpacking adventure. I’d taken a bus from Fairbanks south, and the weather wasn’t so great; not raining, but overcast. I didn’t really have any idea of the scale of the landscape I was amongst at the time. The bus dropped me off on the highway, at the Edgerton Cutoff, and I hitch-hiked from there in to McCarthy (about 90 miles). That was an adventure in itself, maybe I’ll recount it another time. Upon arriving in McCarthy – well, let me correct that – upon arriving just outside McCarthy (the road ends at the Kennicott River. A small footbridge leads across the river, and it’s a half mile walk in to town), I set up camp by the river, had a bite to eat, and went for a walk up the river, toward the Glacier. The sun had come out, and it was a gorgeous afternoon. This scene, sans the snow and alpenglow, was pretty much what I looked at from my tent. And I hadn’t even begun my backpacking trip yet! Regardless what the next week or so brought me, I knew I’d be back here sometime. And so I have been. Many times, in fact. And hopefully, many more. I’ve hiked and explored quite a bit of the park, including some pretty remote areas in the backcountry. Wrangell – St. Elias National Park is home to some pretty grand scenery, I assure you, and I fully intend to explore some more, and find and photograph some of those lesser known gems I stumble upon. But, I also enjoy going back to some of the scenes that caught my eye on that first ever trip here, and are, largely, the reason I’m in Alaska today. And, I hope, will be for tomorrow. This entry was posted in Alaska, Landscapes, Musings, Winter, Wrangell - St. Elias National Park and tagged Donoho Peak, Kennicott Glacier, Landscapes, scenics, Stairway Icefall, Winter, Wrangell - St. Elias National Park, Wrangell St. Elias on April 9, 2010 by Carl D.
With the long foreground here and the sun-drenched mountains, you have successfully captured both the cold, distant openness of Alaska and the beauty. Great image.